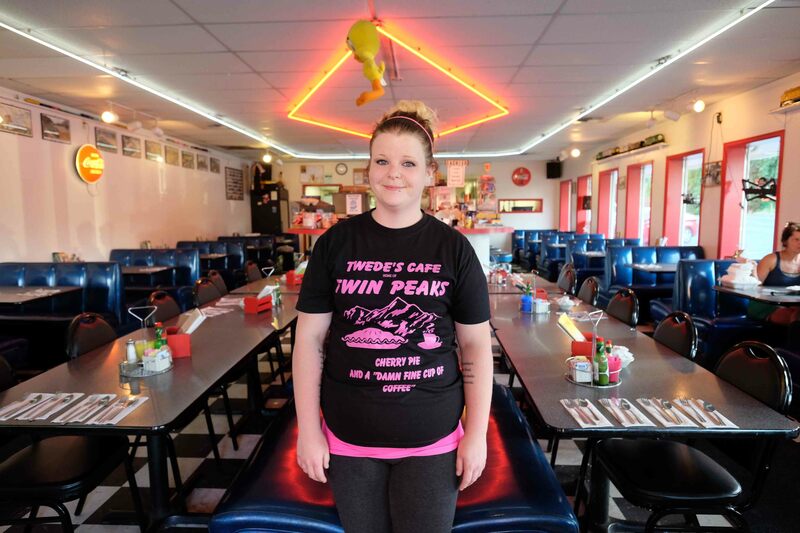 For the past two days Jennifer and I have been in Twin Peaks country. 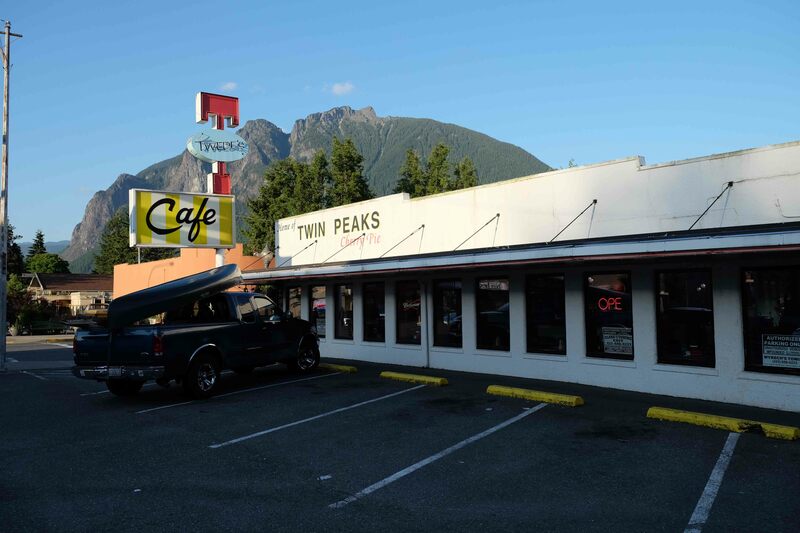 Twin Peaks was filmed largely around Snoqualmie and North Bend, small logging communities about 50kms east of Seattle, in Washington State. Our hosts during this stay were Lynda Lozner and Dale, her husband. Lynda has been very active on the blog almost from the start – and when she heard we were coming to the US she contacted me to see if we were coming up their way. 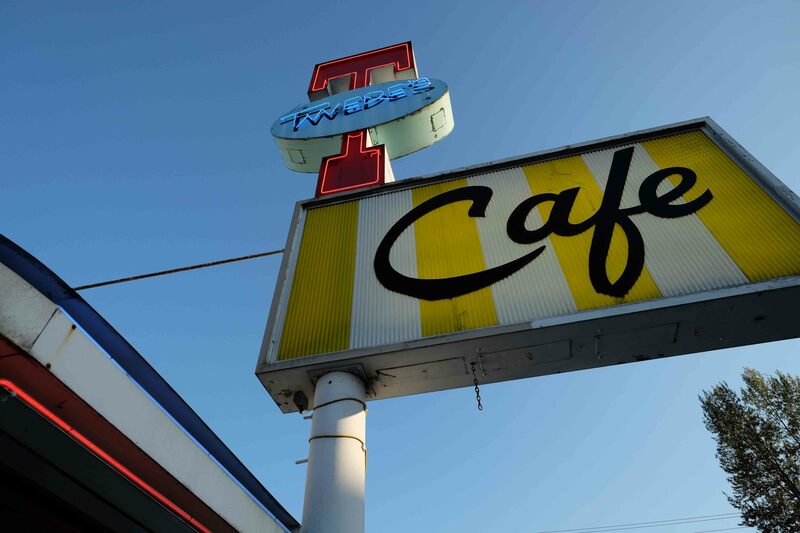 We met at the Tweed Cafe, now known as the Twin Peaks Cafe. 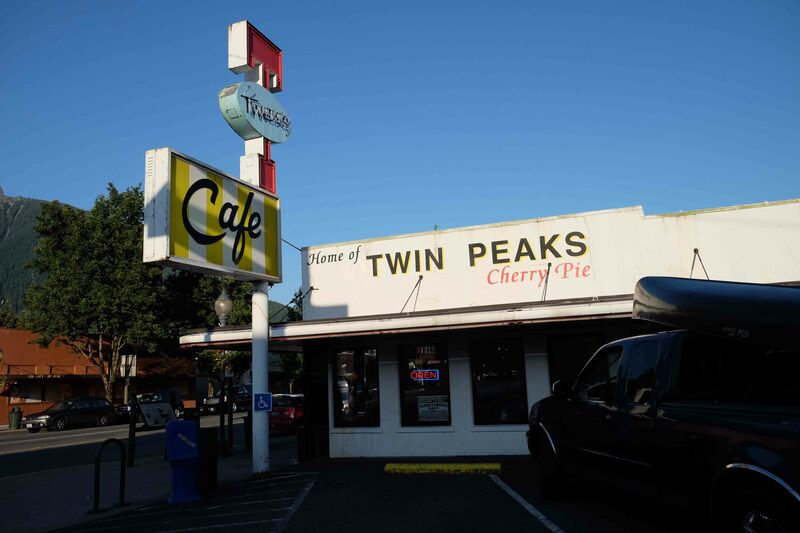 If you’ve seen the tv series, this is where the Kyle MacLachlan character, an FBI agent, used to have his cherry pie and a damn fine cup of coffee. 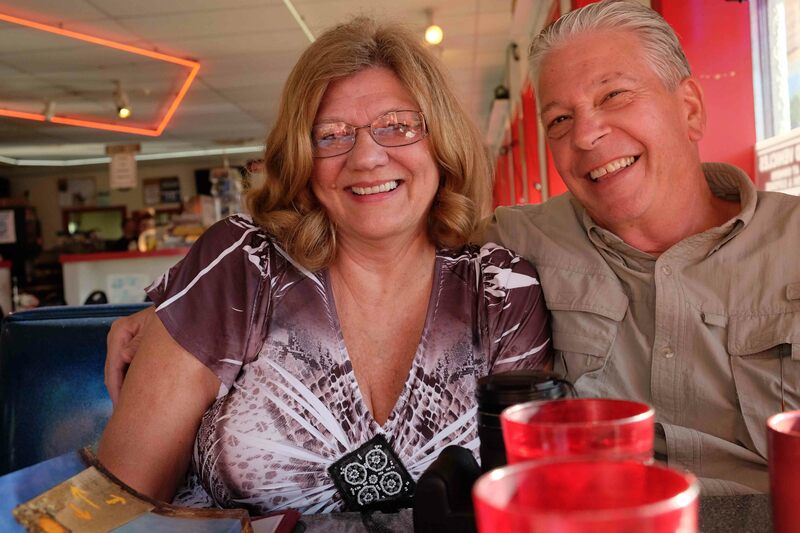 Lynda and Dale greeted us at the cafe like long lost friends – huge hugs and laughter. They also gave us each a welcome pack full of local goodies, including coffee cups from the diner, which will be wonderful mementos. This was our waitress – a lovely lass who very patiently allowed me to film the cheery pie, after she’d cut it, and with just the right amount of cherry dripping out. We stayed until the diner closed and we were kicked out, then we continued our talking in a nearby bar. The crazy thing about this blog is that when I finally get to meet some of you, I feel as though I’ve known you for yonks, yet of course you’re complete strangers. That was the case with Michael and Kathryn Schelsinger in Newport, Jill in Palm Springs, and now Dale and Lynda in Washington State. The next day we drove into Seattle and met at the famous market – Pike Place. 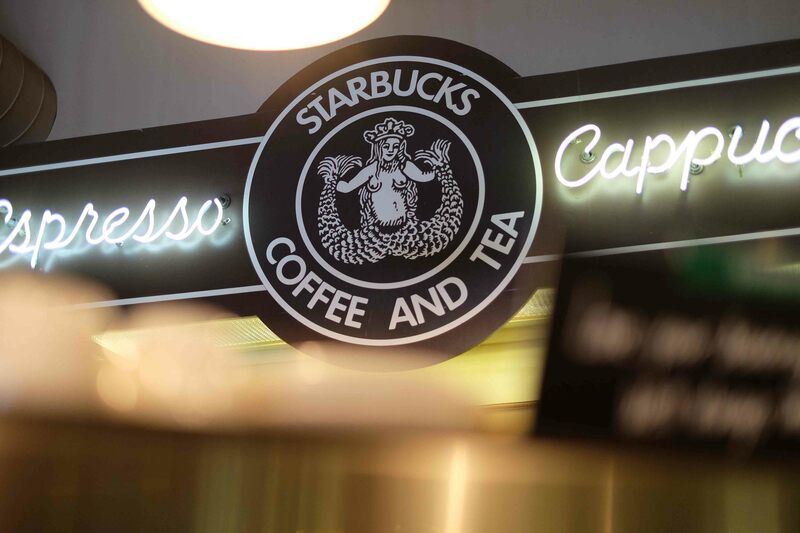 This is where Starbucks started up, and we dutifully had a coffee at the very first original Starbucks – a tiny dump of a place just opposite the markets. 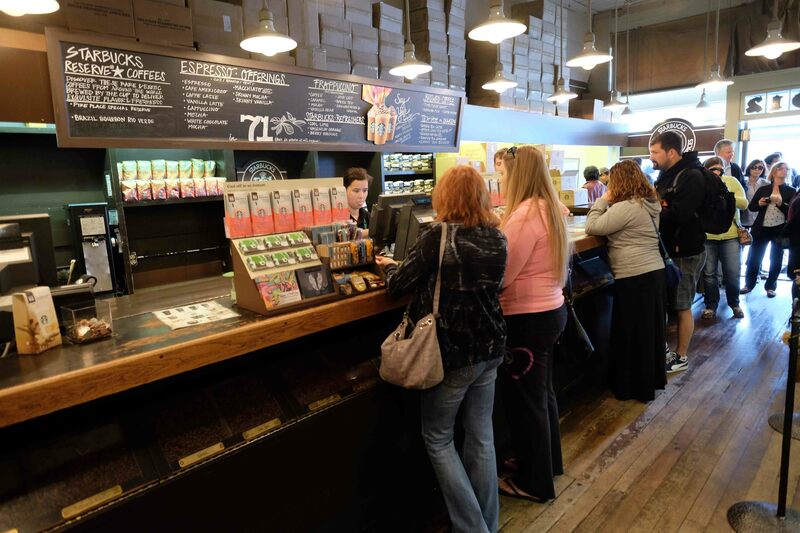 There was a line of tourists out the door who wanted to see where this coffee empire started. 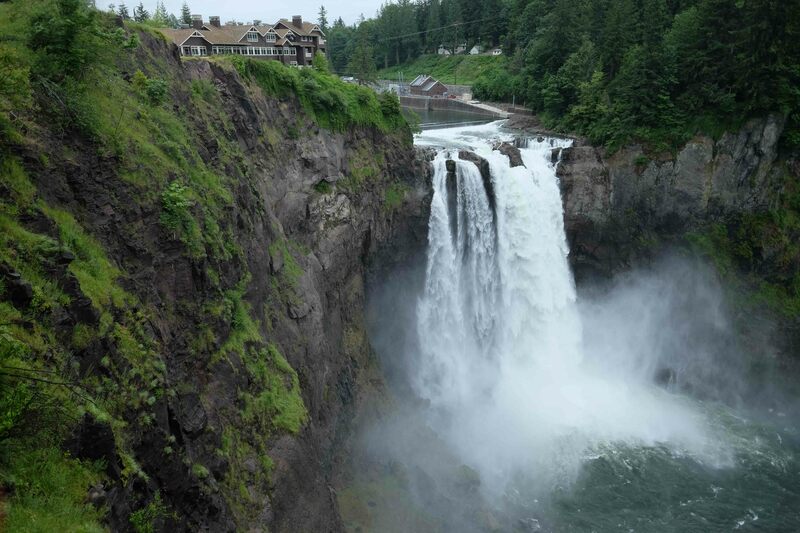 We then drove to Snoqualmie, to visit the waterfall and the creepy lodge made famous in Twin Peaks. 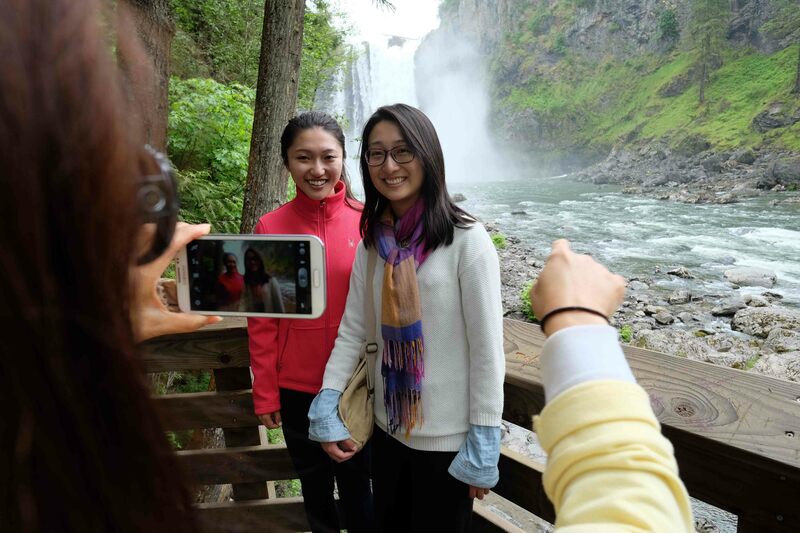 We walked down to the bottom of the falls where several Japanese were taking photos – of course. I ordered the “Who’s your Daddy,” which consisted of enough meat to feed a small African nation. 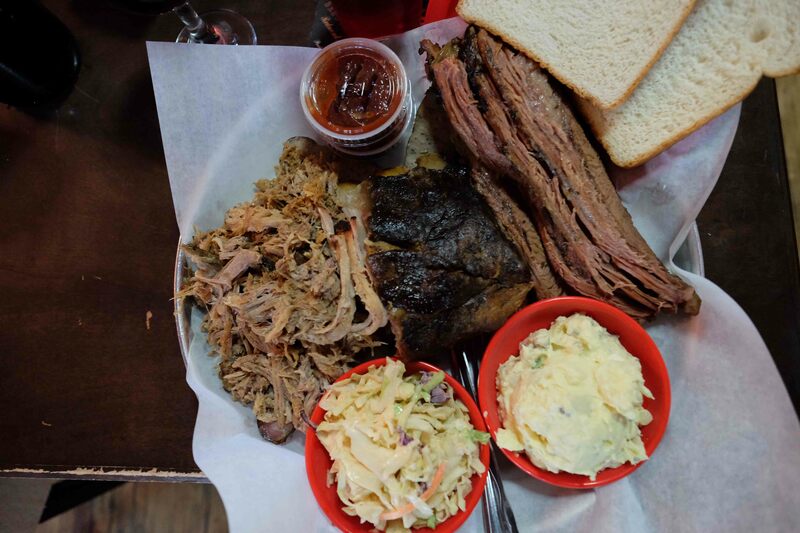 This photo below does not give you any indication of how big the portion was… there were three sausages hidden underneath the half pound of brisket. Again we talked. We talked about the Camino, and we talked about intuition. Dale said he wasn’t at all intuitive. I asked him whether, when he first met Lynda, he’d had a gut feeling that this was the gal for him. He said that yes, he definitely felt very strongly that she was. That’s your intuition, I told him, telling you you’ve met your life partner. Dale pondered this, and finally had to agree. Lynda and Dale walked the Camino Frances last August, and it’s safe to say they haven’t been the same since. It’s had a profound impact on them. So much so that they’ve downsized, and are restructuring their life so they can walk more Caminos. They’ve even put their hand up to come on the Assisi Tour, should things work out. Lynda, in anticipation of our coming, had done extensive research on Australia, Mudgee, and Jennifer and me. She and Dale had watched a few of my movies, and they knew all about Jennifer’s former life as an accomplished actress. They both asked us a bunch of questions, which we were more than happy to answer, as best we could. They wanted to know all about Vegemite and Aussie Rules, and Dale even knew more than me about the coming game against the Gold Coast Suns! They made us feel very special. We said our goodbyes outside Stan’s BBQ and Jennifer and I walked away feeling that we’d met two very wonderful and courageous people – two people with a driving zest for life, and an extraordinary generosity of spirt. 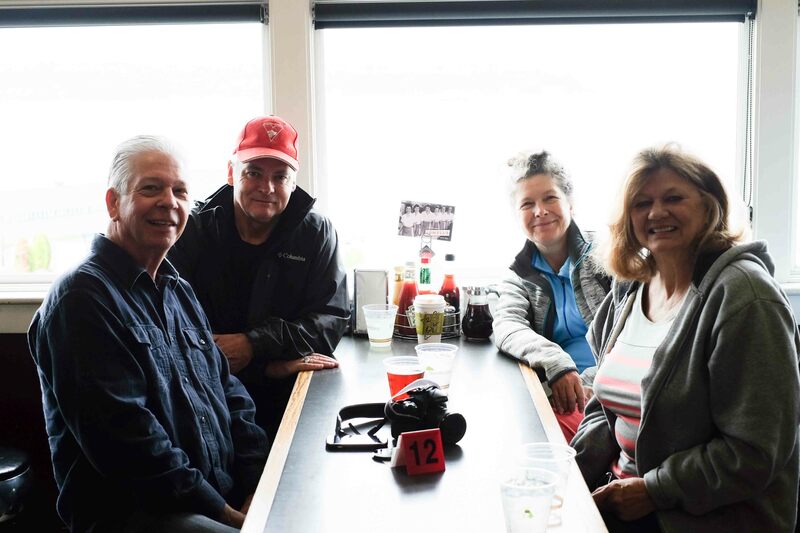 This entry was posted in Post Camino and tagged Lynda Lozner, North Bend, Snoqualmie, Tweeds Cafe, Twin Peaks Cafe, Twin Peaks diner by Bill Bennett. Bookmark the permalink. 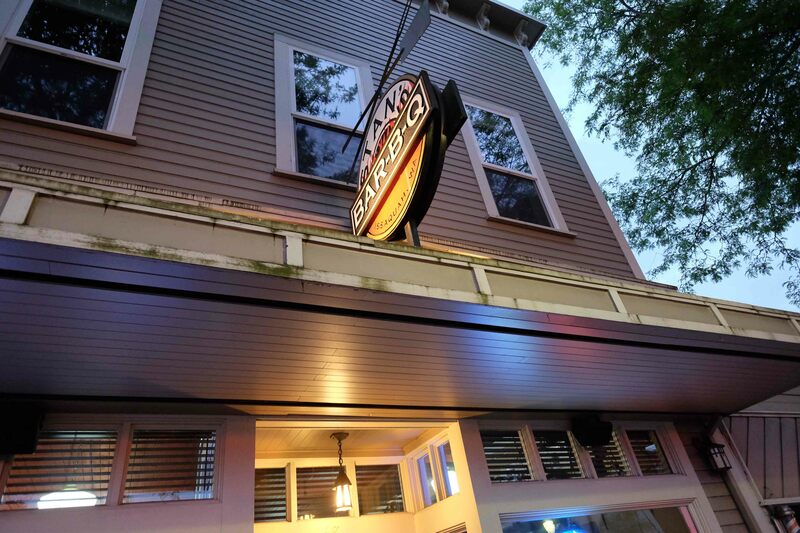 I chuckle each time you mention that the “headroom” is not right in one of your pictures taken by someone else…. I just scroll down and make it right when I’m looking at the pictures! 🙂 So glad you’re having a great time here in the States… I don’t think you’re getting as far as the Heartland… the Midwest (I’m in Omaha, NE) but you’re certainly welcome anytime… I still think we need to sit down and figure out how our genealogy gives us the same last name! Enjoy the rest of your trip! Gosh guys, I feel likeI was there with you. Lynda, it is so great to learn more about you and see more of you then tht little gravitar picture, and now, get acquainted with Dale also, who has now come out of the shadows. Makes me want to come up your way and get the tour myself someday. Stranger things have happened. You are people I would like to meet. Just want to be sure it is the dry season as I might do it on my motorcycle. Bill, you constantly amaze me with the things you find to say and photograph in your blogs. Makes me reconsider doing more blogging myself as it would force me to pay more attention to the everyday people and things around me, whether traveling loong distances such as you are doing or just finding observing more in my day to day life. Pictures should be no issue, because, after all, I alwys have my trusty iPhone in my pocket. I am sittiing in the back yard swing having morning coffee at our country place, looking around asking myself what is interesting, and if I use your eyes, everything is. You inspire me mate. I feel a blog coming on. Stay tuned. There will be one today at steve2013dotnet.wordpress.com. I have to find a way to shorten that name that wordpress assigned me and maybe even make it more interesting. 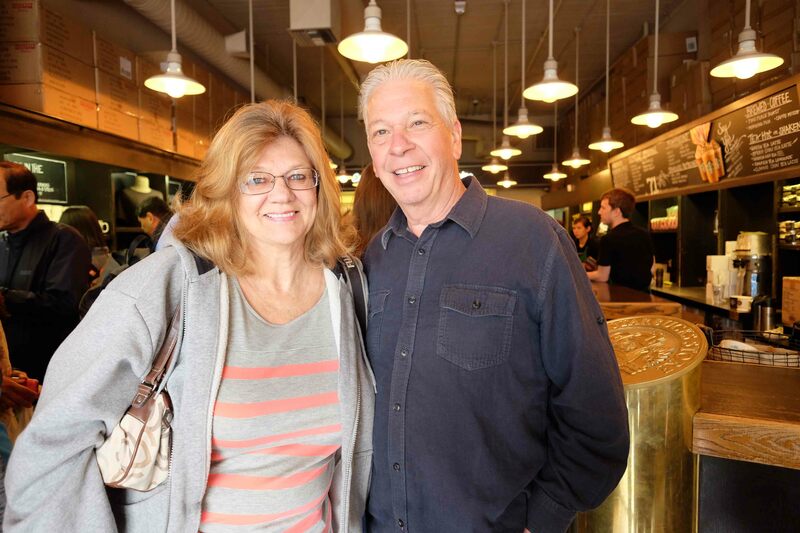 Thanks, Bill and Jen and Lynda and Dale for allowing me to shrare my morning coffee with you. Honestly, today’s blog made an impact on me. I might not have been bitten by the Camino bug, but I love how the Camino has brought so many new and interesting people into my life. Hi Steve, thank you for saying this. Lynda and Dale are surprising people. Wonderful people. You’d like Dale. He has an open practical disposition, and is curious about all things. Like you too he keeps a healthy distance from things spiritual, and yet he is not averse to embracing new things, new concepts and ideologies. 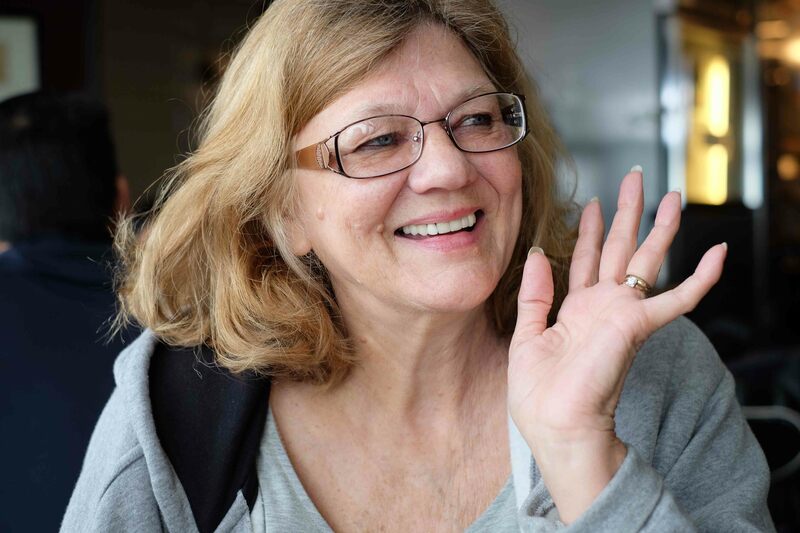 You’d like Lynda too – she is a blast! If you want to change the name of your blog, let me know what name you want and I’ll see if I can help you. Just email me on billpgsblog@gmail.com. Would you like to do a guest blog here? I’m sure everyone would like to hear your take on things – whether it’s on the tour, or your general thoughts on the Camino. Or whatever. I feel a conversion coming on mate! Love to meet you. Also, I think you should consider Italy. We had a talk on vegimite with Bill and Jen. Appears it is like peanut butter is to Americans. A staple, but hard to get outside the country. What is your take on vegimite? You tasted the vegemite. Right? It’s available on Amazon and I thought we might try it. What did you think of it? We’ll have to take peanut butter or maybe local candy to trade in Italy with the Aussies. YOU KNOW YOU ARE GOING TO ITALY!!! Steve, I disagree. I think you have been bitten by the Camino bug. Just in a different way. Lynda and Dale, it was lovely to meet you, through the blog. You live in a beautiful part of the world. Are you going on the Italian tour? If so, hope to meet you. We are planning to be on that tour. I think Steve will cave and be on the tour also. It will be fun to meet more of our growing Camino family. Meeting Bill and Jen was sure wonderful, both lovely people. I meant to take a bottle of white port with us for the first meet as we had been “practicing” drinking it in the week before their arrival. Tee Hee. Forgot it at home. Bill’s going to post my guest blog of my take on the meeting tonight. I hope all the pictures get posted as I have several of Jen that just “GLOW”. Well, the sun was shining on her face in one of the pictures but her inner glow shows through. She is really a sweet person. 27 hours was way too short, but glad for the opportunity to meet them before Italy! Lynda I’d love to do the Italian tour and the Irish tour and the next Portuguese tour and whatever other tour there is….but I don’t think it’s going to be possible at the moment. Bill and Jen really do attract the best people. We had so much fun on our trip. I still have flashbacks, I still look at my photos all the time and reminisce. It was a very special time. Jen’s inner glow is amazing. She just shines all the time. That’s funny that you were practicing with the White Port. Bill needs some more practice with that too. I had never heard of white port before the tour posts. Goes down real easy!!! Gee, I can’t get away with anything. Sounds like you had a wonderful fun filled day. 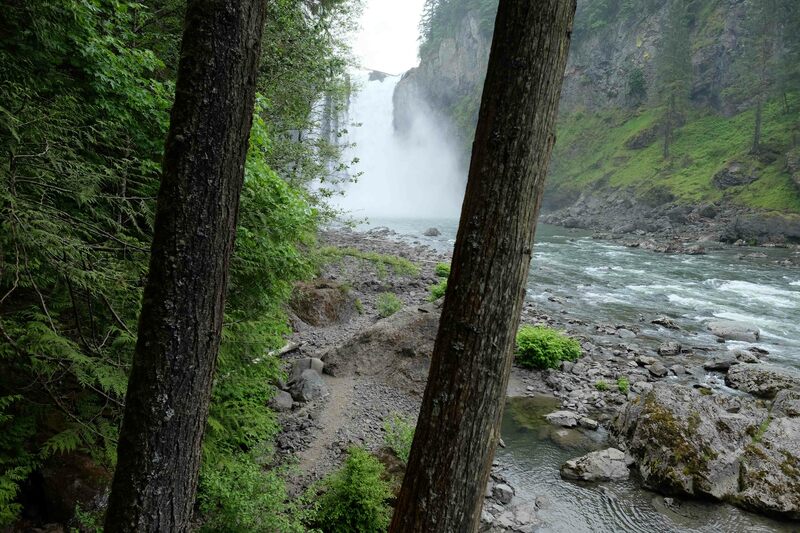 We had talked about a ferry ride but went back to Snoqualmie Falls instead. We did watch the ferries from the restaurant though. Hoods Canal and the San Juan Islands are just beautiful aren’t they? The beach at Alki should be packed with sunbathers today as the sun is out. Ken and I have visited Seattle in 2009 and had to go into Starbuck’s as well Bill. I thought at the time that some tables and chairs would have been handy. We watched fish being tossed from one person to another at the Pike Place Fish Market. Your post brought back some lovely memories Bill. I enjoyed reading about Lynda and Dale. Maybe we will all meet on the Italian Assiss walk. Bill, Because of your influence I did write a mundane blog today, but it is a start. I kept thinking, “What would Bill say about this?”. Keep us posted on the financing. Re financing, had a very interesting couple of sessions here with someone who could make this happen… will talk to you about it separately. Sounds exciting. Hoping for a terrific outcome. Wouldn’t it be wonderful if the movie gets financed, made and we all learn to use our PGS before we do Italy!!! Oh – and by the way, I bet it’s not mundane!! Depends on what you are comparing to. But it is a start. What a great post about your time together! Wow! So much to talk about and such a fantastic way to deepen your friendship. The photos were as stunning as usual – you all look so happy and relaxed. 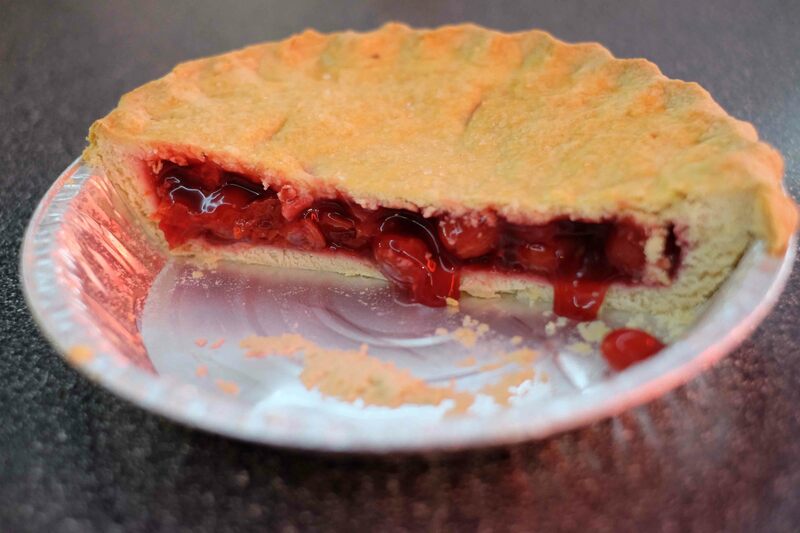 As a confirmed ‘foodie’ I particularly enjoyed seeing the cherry pie photos – yum! We’re lucky enough here in the winter to have US cherries imported now – they’re a beautiful treat and a reminder of summer on a cold day. Lynda – is Bill as outrageous ‘in person’ as he is on the blog? I know what your answer’s going to be!!! Britta, Janet and I will be agreeing with you!!! Bill’s going to post my thoughts of our time together tonight. He should be getting in to Salt Lake City area tonight. Before they left he said something about where he should stay on the way to Utah. He question Boise I believe. I told him toi use his PGS and find a quaint little town that felt right. This morning I was thinking I should have told him Mountain Home Idaho. Talked to him this morning and guess where they stayed! Yep! Mountain Home Idaho. EERIE!! No, Lynda, not eerie, just the expanded PGS working for you too!! 🙂 Incidentally, having never watched Twin Peaks (I don’t watch much TV generally) I am somehow jinxed?!! I’m coming to the States in late July with – now – set plans for where to go (LA, San Francisco, DC, NYC, NJ and Connecticut). Reading about Bill and Jennifer’s trip, I want to change and just do a good old road trip over your part of the world. Will somehow have to fit that into my bucket list!! Wow! That’s a lot to cover in one trip. How much time will you have? That is like going from one side of Australia clear over to the other side. The area up here in Oregon and Washington is beautiful. Shouldn’t be raining in July. The Twin Peaks series was from 1990. As I remember it had to do with an FBI investigation of a girl that died. Really, really good the first season. The second season had some dwarf thing and a log lady and got weird. The movie was unbelievably strange!!! 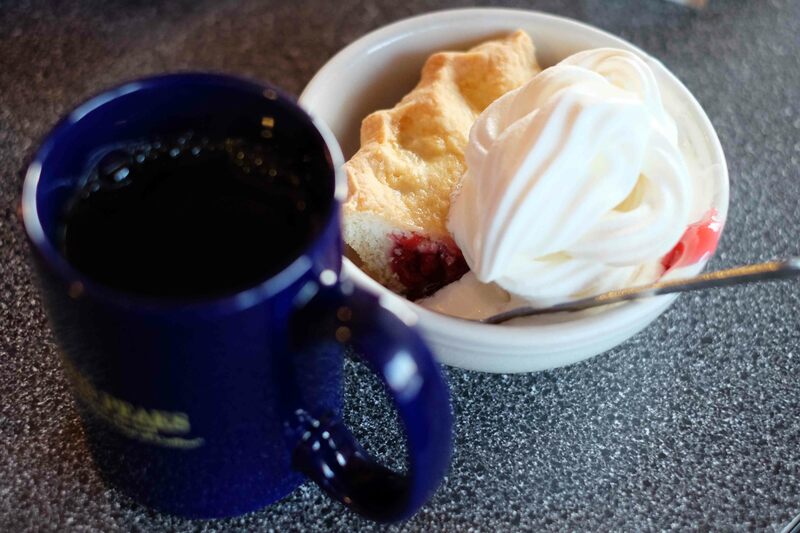 But, it had a famous line about the pie and coffee and now Bill has had some! He is going to post my thoughts of our time together tonight. Probably in the next couple hours I would think. He should be in Utah and I think it is now 10:30 PM there. Miss them already. Felt like family (although they had this accent), could have spent weeks just talking with them. My husband really enjoyed talking with Bill when we went for a short hike. Aww I don’t want to mess up my guest blog. Let me know if you are coming this way! Thank you! It was fun meeting Bill and Jen! Enjoyed it tremendously! Let me know if you are going to make it up this way! Apologies for not getting back to you earlier – a frantically busy few days here and we’ve hardly been at home – all good though. Just catching up on everything now. Yep – Bill sure is outrageously terrific! Well-summed up! I’ll check out the photos of Jen on your guest blog too – cheers for this. Don’t you just love Jen’s calmness? On the couple of occasions we’ve caught up this is something that I feel as soon as I see her. Look at the pictures of Jen on my guest blog. She just is a beautiful person. Yes, Blil. You are too. I just didn’t know much about Jen until our meeting. Good people to head our Camino family. I didn’t mean it like that! Bill, we all know you so well and we see your picture everyday. We KNOW you and what a wonderful person YOU are. Didn’t know much about Jen except for a few pictures from Portugal and her boards on Pinterest. Have tried to get some of her movies but am having trouble cause most offered are VHS or PAL. I think we still have a VHS player stored away so will be digging that out. I fell asleep (it was 2AM) before her brothel scene in The Nugget. Anyway, I don’t want to sound gushy but I found Jennifer to be a really nice person with a beautiful smile on her face at all times. OooH just noticed I spelled Bill wrong above and didn’t correct. Anyway, since Jennifer doesn’t have such a presence as you do on your blog, I was just trying to tell Jenny Heesch that I thought Jen was great and has a beautiful glowing smile and presence. I didn’t mean to slight you. Hooly Dooly! You know I think you are both terrific! I had just answered Jenny that you in person are outrageously terrific. Accept my apology? haha – yes, this comment of yours DID get caught in the spam filter!! It’s watching my back – I love it!! I was just fooling around Lynda. Jennifer is a beautiful person in every possible respect. I’m a very lucky fella. Am I in trouble? My apology didn’t post! Don’t want to sound like a stalker! But I do think BOTH of you are fun, genuine, down to earth glowing people. Enough said. I enjoyed the time spent with you BOTH.